Rated 5 out of 5 by nadaze2da from Magician's Assistant Needed! Although the story begins with the missing boyfriend, the plot surrounds the girlfriend. She awakens from the plane crash in a creepy bedroom and subsequently discovers that she is actually auditioning for the position of assistant to Harry Houdini's adopted son. What comes afterward is magic! How can she free herself and her boyfriend, if he is still alive, and complete all the tasks ahead of her? That will be revealed as the game progresses. This is an engaging and entertaining game. HOGs were well defined and some of the reverse ones required a bit of thought. I couldn't say what the sound is like because I played without it. The graphics are good but not stunning. Gameplay is good but I didn't find it particularly challenging. The objective of completing a task is understood but accomplishing it may require a bit of sleuthing back and forth. This is a game worth purchasing. It makes you want to know what comes next! Rated 5 out of 5 by taigood from Great! Very well done, very interesting and... clever! This HOPA has it all. Rated 5 out of 5 by SrRat from Excellant! All I can say is, "Wow!" This is a splendid game! The elements are top notch: depicted locals, HOSs - not the usual, graphics, music. The story line is ok - an adopted kid trying to outdo his mentor. There was nothing about this game I didn't like. An added treat are the pictures of Houdini that are scattered throughout the different locals. The items in the HOSs also keep to the period. Very nice. Rated 5 out of 5 by Poutoule from Magician, plane crash, creepy house !!! Played 25 minutes, casual - 2 modes, casual and expert - Integrated SG, stays on the page you leave, you can check it all during the demo - 9 chapters plus bonus play - Voice overs - Music a bit loud - Note book - No map - H0. you interact, some objects are really difficult to spot - In other "H0" you have to put objects back that fit with others - Hint button, takes a while to refill, only tells you there's nothing to do outside H0 - Skip button, quite long to fill, casual - Mini games not over difficult - Beautiful graphics A plane crash !! Changes us from car crash...Magician, creepy house, good ingredients to make a good story and game. A buy for me. Rated 4 out of 5 by kahfess from Come Join the Show I felt this game was pretty good, while there was room for improvement, it did offer up some nice lengthy game play. The story line was easy to follow and was pretty much straight on. The graphics were nice and sharp for the most part, the sound and music was nice. 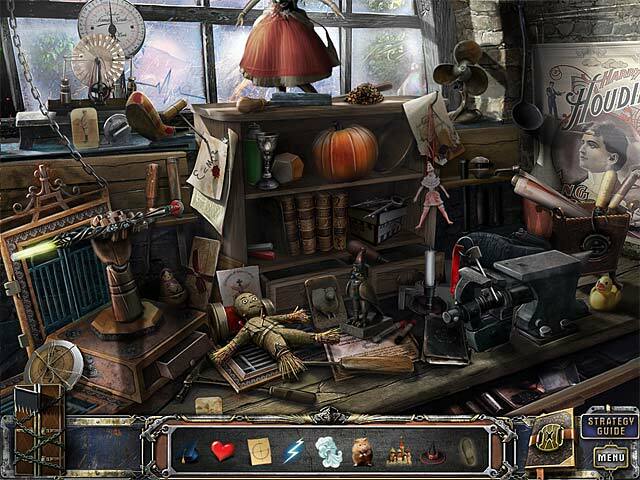 The two kinds of hidden object games offered a nice variety for the hidden object scene lover and were challenging but not impossible to do. The hint button for the HOS worked well. The skip button on games wasn’t the fastest, but far from the slowest I’ve seen to charge. 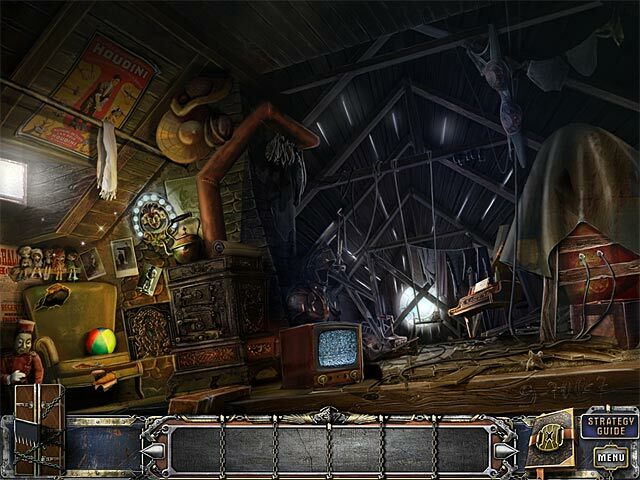 The game offered up a nice mix of hidden object, adventure and puzzles. The bonus play was a nice addition to the game, and also enjoyable. The entire game seemed to run smooth without glitches. There were a few things I didn’t like about the game. If you found yourself stuck and needed a hint, the hint button really offered no viable help in those types of situations other than to simply let you know there was nothing you could do in that scene at the time. Since the game also did not have a map, it would have been more enjoyable had the hint button offered a little bit of help, even if it were only in the arrow pointing you in a general area of the game. Because of the fact the hint button really offered no help in some situations, I found myself breaking down and looking at the strategy guide during part of the game just to get playing again. I’d visited every scene and ever scene had clicked the hint button only to be told there was nothing else I could do in that scene at that time, it’s at that point that I resorted to the guide for help so I could then continue on my own. Overall, it was a nice game, and I would recommend it but only if you are willing to buy the collector’s edition so that you will have some help when the game itself offers none. Rated 4 out of 5 by TheFlashback from Excellent for beginners This game is very good for those who just start playing adventure games. Graphics and FX are very good. Storyline is interesting but average. The gameplay is way too simple and not engaging whatsoever. I completed everything in hard mode including bonus chapter in less than 3 hours. Very good for beginners – experts will be frustrated. B- I should give this dev company a credit since they seem to be a new kid on the block. Rated 4 out of 5 by walkswithdogs from Could Have been Longer This game had the makings of a nice, easy rainy-day-on-the-couch sort of game but it was too short for that. It was a little easier than I am used to but, like I said, good for a relaxing afternoon had it been a bit longer. Even the extra chapter was rather short. Someone else, in their review, mentioned that this was a first effort for the developer, and if so, they did an excellent job. I liked the graphics, the music was alright and the story was nice. I didn't run into any glitches either. I think it is worth playing but wait for the SE. The extra chapter is not really worth it. Rated 4 out of 5 by grunny50 from I will buy this game! I just finished the trial on this game, and I found it to be original, interesting, fun, and worth my money. I haven't played games from this developer before, and I find that they had a fresh perspective in the scenes and in the storyline. Worth my cash. Rated 4 out of 5 by mommabj60 from Fun for hours I really enjoyed the hidden objects games and the puzzles in this game. I would recommend this game to all the people who like hidden object games. Rated 4 out of 5 by natday74 from Pretty good game I played the demo and like the demo so I bought the CE. I really liked the HOs, especially the "association" ones, it added something different to the standard junk pile HOs. there was quite a bit of "back and forth" but it was enjoyable. I played on casual mode, loved the journal, and really liked the strategy guide for help when I missed a pick up. The storyline was a little weak, but I don't play for that. It wasn't too challenging, but was challenging enough for a fun afternoon. Rated 4 out of 5 by Tiger2010 from Fun, but not blown off my chair I wasn't sure if I would like this game as the subject matter of Houdini isn't really my thing, but I'm glad I persevered because it did grow on me. Graphics and music are good, as is the storyline. The puzzles are not the most challenging, but entertaining enough. I counted 20 H0S scenes in the main game. They are divided equally between the usual list of items and 'association' H0S which I've never seen before. Some of these items were somewhat obscure, such as a clothes button and a power cord. OK, I get the button/cord but I was looking for a needle and thread or a garment for that button. The game isn't the longest. I actually enjoyed the bonus chapter more than the main game, but that's rather short too. I'm not sure it's worth paying the extra for this one, but I did have fun with it for about 5 hours all in. Rated 4 out of 5 by biscuitsmama from I Really Like This Game What a great, fun game. This one has it all with great graphics, sound and challenges. The storyline is interesting and held my attention throughout the game: I was always looking forward to getting new information so this kept me entertained. BFG has given us another winner. Hope you will enjoy playing this "Houdini" game as much as I did. 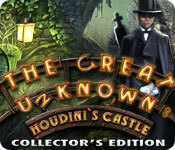 Rated 4 out of 5 by EdsMom311 from SHORT STORY: The Great Unknown Houdini's Castle I was really looking forward to playing this game. But the length was way too short. Guessing it took me less than an hour and a half to play the first part (didn't time it). Very, very disappointed with the length. I have not played the bonus chapter yet as I am guessing it will be even shorter! !.........For a CE it was not worth the money due to the length. Should have cut the bonus chapter and combined it with the first part. Feel like I was taken advantage of BF. A map would have been nice, that is the only thing I would have liked to have had at times. Definitely not worth the CE price. Rated 4 out of 5 by mephistopholes from Good HOG This is a nice game for HO aficionados. The story begins in a familiar way - crashing on an island - but the story develops OK and the graphics are nice and clear. The hint button charges in good time on casual mode, though there was a fair bit of toing and froing. An interactive map would have been much appreciated. The bonus story was short but wrapped up the ends nicely. Rated 4 out of 5 by firebird40 from Completed Game Review As someone else said, I think this is the first game we've seen from this developer, and they did a good job with it. The graphics, music, and technical parts of the game play are all very well done. Its adventure lite, mixed with some hidden object and association scenes, and these I thought were fairly clear, although I had some issues with the association scenes. The storyline is a bit weak, not as enthralling as I would have preferred, and leaves questions unanswered. I think it may be the weakest part of the game. There also is no map. The game is fairly short, under 4 hrs for me, which is too short for a CE in my opinion. All in all, its a very good first outing for this developer, though I would recommend waiting for the SE unless you are really into the bonus content, wallpapers, etc. Rated 4 out of 5 by dancemom1 from What's the story line? I am not familiar with this dev, but there are so many, I can't remember them all anyway. Like so many others, I am fascinated by the mystery of Houdini, but this game just didn't grab me...no "WOW" factor. Partly because I'm not sure of the story line. A bit hard to follow what is happening or why. That said, the graphics and game play were excellent, music nice, games easy, HOGs simple. Didn't use the hint, so don't know about that system. Nice SG, except that you need to tell us how to get back to a place, e.g. back 2, left one, up and right, etc), rather than "go back to the barn." So much jumping around that it is difficult sometimes to remember where something is. Otherwise, give us a jump map. Time saver and very helpful. I did like this game and will purchase, but not right now. This one I will put on hold in the puddle for a CE special or something. Thanks for the reviews. Rated 4 out of 5 by reesy37 from Worth buying. I like this game. I played through the demo and enjoyed it. Not exceedingly difficult, but good story line. This will be one for me to play to relax instead of stressing over really hard puzzles and needing to use the SG. I am downloading full version now. If you are a die-hard player who needs a big challenge when you play, this may not be your cup of tea. For me it is a nice fit. Rated 4 out of 5 by 0Jade from Adventure mixed with HOS Game starts with funeral for a friend, jumps 50 years, a strange weapon aimed at the sky, a plane out of control, and you wake up at Harry Houdini's house. Basis for story is that person who kidnapped you is testing you to see if you are that "special person". Nuff said! Game options allow you to adjust the music, voices and sound, and there are full screen, wide screen and custom cursor options as well. No options on sparkles. 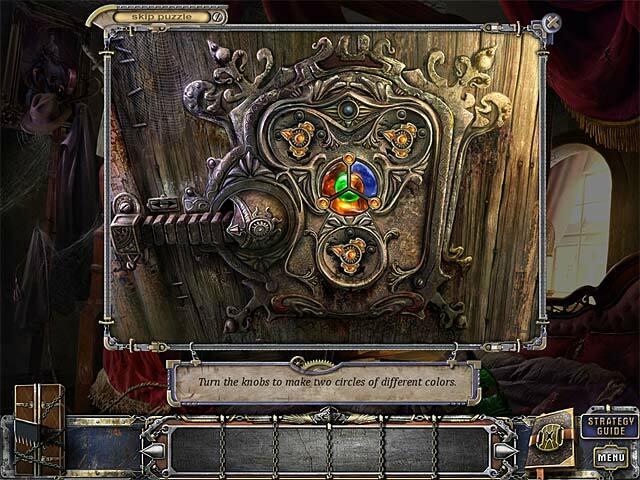 Sporadic hidden object scenes are a combination of regular HOS and an association game such as carrot goes with rabbit. Some can be quite tricky. Large crisp objects, and no click penalty. Mini-games are typical with a skip available after a short time. Soothing appropriate music, strategy guide has 9 chapter plus a bonus, but game moves fairly quickly. No map, no diary, no morphing objects, but you do collect film reels for the backstory and there is lots of walking around. Not my all time favorite, but a good effort. Rated 4 out of 5 by Sheerija from REVIEW OF COMPLETED GAME I think this is these devs first CE and they really did a good job with it. The graphics are very good and I loved the story. It's not how I remember it, but I think it rather comes from the author's imagination, though they did stick to the manner of Houdini's death, but it's certainly well thought out. They have the technicalities down pat, making it a real pleasure to play. The music is just fine and the puzzles are challenging but not frustrating. Some new ones I have not seen before. The BC was a follow-on from the main game and not just tacked on as I have seen more than enough times and hated it. It took me 45 mins. I did enjoy it but with a few reservations. First, the HOS are rather too dark and they also gave me difficulty in that I had trouble matching the items up. I do not know if that was just me or if there is a certain lack of logic there. Second, there was something I wanted to know before the end of the game, but it was not revealed. Lastly, it came in at under 4.5 hours including the BC. I expect a CE to be longer than that, though I will not quibble too much on that score. For a first attempt, if it is, they did a terrific job for the most part, much better than many I have played lately from more well established and popular devs. An extremely good effort from these devs, who showed imagination and the ability to create a good cohesive game. Rated 4 out of 5 by HERSON_1 from Fun Hidden Object Game I have bought many games of this kind and found this one to be truly fine. Fantastic graphics and great story line. Excellent audio and artwork. Would recommend. Rated 3 out of 5 by campingramps from This is a tiring game. Although this has pretty nice opening scenes, that's where it ends. If a game can be tiring, this is it. you have to flit back and forth finding something to open something else 4 rooms back that really doesn't help much. All I ended up doing was going back and forth and getting no closer to the outside or to the objective. The HO's are a joke. The objects are very difficult to find and not fun. And then they have the association type puzzle where they give you an object and you have to associate it with something in the scene. Half the time the match is not what you think. That is the biggest con in this game. Some people might like this type of game but I'm not one of them. I don't recommend this game. Maybe the SE is better. Rated 3 out of 5 by mrm2006 from By trial and error I tried this game both with the collector's edition and without and would highly recommend getting the CE because during the regular game the hints would say "there is nothing more to do in this area so go elsewhere" while the CE integrated strategy guide would get me through a thing or two or three in that very area at that very same time. My big disappointment and disillusionment (hah) was you're into the game for a good hour and still no evidence of a storyline other than a plane crash 50 years after Houdini's death. I wouldn't consider purchasing a game without a little more depth than that but, hey, that's just this glam-ma. Rated 3 out of 5 by tookat from A Muddled but Good Attempt I do not like giving bad reviews, and often will not, except that this developer is obviously trying to improve their product. There is much to like here, good art work, a stroy line that could be interesting, some excellent puzzles. There is also a lot that is frustrating. I had to play with the "music" turned off. The Hint button provided no better hint outsede of the HOS than to say "try elsewhere". If I knew where to look for the missing item, I would not be hitting the hint button? A no help at all, especially when they do not provide a map and there is a lot of running to and fro from place scene to place scene to try and find what is missing. I was intrigued by the variation on some of the puzzles, but the reasoning for two objects being united, was sometimes so thin, it could only exist in the programmers head. I had to use hint more often than I prefer, but it finally saved me the time for hitting first on the clue box, and then on each item in the scene. Persons with Carpal tunnel syndrome, beware! Oh yes, and I have just about had it with games including bonus chapters, without including a walkthrough for them, and not having a full Strategy Guide to boot....and the only reason I am not put off by the shortness of this "extra chapter" was because I was tired of the game...or I would be complaining. Rated 3 out of 5 by catbag8717 from Real Killer For Me Was Confusion After taking a break from online gaming, I stumbled upon this game, and it was a real confusing one! Good Parts: Thrilling intro! Absolutely loved it, and supported by a decent storyline. The hidden object scenes (junkpile) were good. Pretty decent graphics for a modern game. Could use a little work though, but overall still acceptable. Great voice-overs. The film reels were an excellent adition to the game, uncovering more of Alan Whitehead's story. Hint recharged pretty fast. OK Parts: The puzzles. Some were a great challenge and real fun, others were a pain. The fun factor of the game was marred by complete confusion. Bad Parts: The "association" Hidden Object Scenes were utterly ridiculous and just a complete waste of time. The strategy guide was useless unless you used it right from the beginning. The game was confusing! I had no idea what to do next and most of the time the hint wouldn't help either. I tried to use the strategy guide but couldn't. So annoying. I was just confused beyond my mind throughout this game. Sorry to say, I can't recommend. Rated 3 out of 5 by CyndiLouWho2 from NOT WORTH THE MONEY - WAIT FOR RELEASE OF THE SE!! I seldom buy a CE game because the added extras usually aren't worth the extra cost. But the storyline was so intriguing that I purchased this one after the sixty minute trial period was over. What a mistake! Please don't waste your money on this Collector's Edition -- wait for the Standard Edition to come out. All you get with the CE is a VERY short Bonus Chapter, goofy wallpaper and 20 small photos of poorly drawn concept art. THE UPSIDE: * Fairly decent graphics overall * Great voiceovers * Didn't time the game, but didn't feel cheated due to it being too short. * Hint & Skip bars filled quickly * A nice mix of puzzles and HO scenes. Half of the HO scenes were matching pairs of items * Built-in Strategy Guide * If you liked the music, you could go into the Extras and re-play the soundtrack THE DOWNSIDE: * Most of the HO scenes were dark & it was difficult to find what you needed. Some objects weren't drawn very well either. * There was no map so you will have to do quite a bit of backtracking * While the Hint flask refilled quickly, it didn't help you by suggesting where to go next. It would just say "Nothing more to do at this location right now" * Many areas still sparkled even after you had completed them and there was nothing left to be done * The beginning of the story wasn't put together well. * The ending was weak and rather disappointing * The Bonus Chapter was very short I can't recommend paying $13.99 for this one. Wait for the release of the Standard Edition. Rated 3 out of 5 by Ktallia from Not worthy of the Houdini name! As my review title mentions this game is not worthy of the Houdini name.. This game is not worth the price you pay for the collectors edition, there are much better games then this one. The graphics are well done but the plot left much to be desired. I didn't like the wallpapers or the voice overs. The extra game play seemed pointless. If you are looking for a game to get into give this one a miss, its not worth your time or money. Rated 3 out of 5 by Margie413 from Short CE game. Even though this was a good game to play, I don't think it was worth being a CE. I finished the game in less than a day. The length of the game was not a challenge. I am used to playing CE's for a few days. Most of the time when you buy a CE, it has more to download. This game did not. Rated 3 out of 5 by silkhoney03 from Not really worth the time This game is very dull. There's no excitement. It's just blah... The visual/audio aspect was nice, but nothing to write home about. The storyline was poor. I mean, it made no sense! Was it the future or the past? Mixing Houdini and a plane crash... it 's just lame. The HOS's were very " first day of kindergarten" easy. There was no real challenge to the game and no incentive to reach the end. It was like so many other games we've seen before. Not worth my time or money. Thank glob for trials! Rated 3 out of 5 by heidie0 from Right so to each their own This is only my opinion, so here goes. Maybe I am spoiled by some of BF's truly great games, but I found this one to be a bit boring for my own personal taste. Houdini showing up just in time to point his arm outward and use his wand whenever he is present was just not my thing. Now, on a lighter note, the graphics were good, and the music was not annoying at least to me. Sorry, I would not buy this game.